Profilometry is a technique used to extract topographical data from a surface. This can be a single point, a line scan or even a full three dimensional scan. The purpose of profilometry is to get surface morphology, step heights and surface roughness. This can be done using a physical probe or by using light. Metrology is the science of measurement. How rough is the sample? How high are the features? How much of the area has voids or particles? What is the defect density? Answers to these questions are often quantified using profilometry. All profilometers consist of at least two parts – a detector and a sample stage. The detector is what determines where the points on the sample are and the sample stage is what holds the sample. In some systems, the sample stage moves to allow for measurement, in others the detector moves and in some both move. There are two types of profilometers: stylus vs optical. 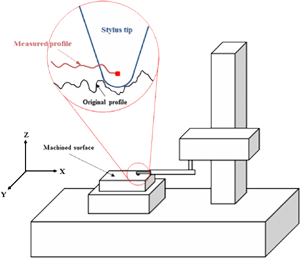 Stylus profilometers use a probe to detect the surface, physically moving a probe along the surface in order to acquire the surface height. This is done mechanically with a feedback loop that monitors the force from the sample pushing up against the probe as it scans along the surface. A feedback system is used to keep the arm with a specific amount of torque on it, known as the ‘setpoint’. The changes in the Z position of the arm holder can then be used to reconstruct the surface. Because a stylus profilometer involves physical movements in X, Y and Z while maintaining contact with the surface, it is slower than non-contact techniques. The stylus tip size and shape can influence the measurements and limit the lateral resolution. Optical profilometry uses light instead of a physical probe. This can be done a number of ways. The key component to this technique is directing the light in a way that it can detect the surface in 3D. 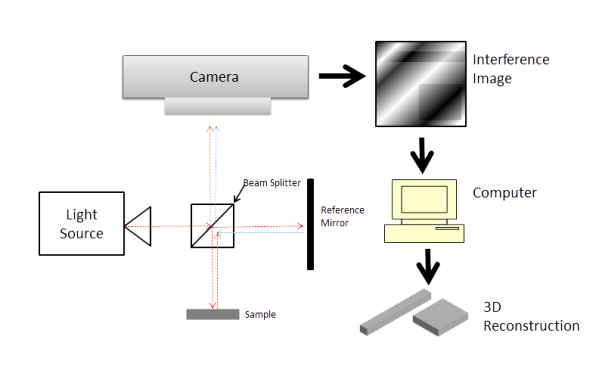 Examples include optical interference, using a confocal aperture, focus and phase detection, and projecting a pattern onto the optical image.